Here are some concerts taking place in the Minneapolis/St Paul area on April 3 to April 5, 2017. Read more Minneapolis Music Guide. It’s been a few years since we last saw Minus the Bear. The band is back to promote their new album Voids, which just came out on March 3rd, 2017, via Suicide Squeeze Records. Show up early to check out Beach Slang. We saw them at the Triple Rock in October 2016 and noticed singer James Alex had a lot of local Minneapolis fans! 04/03/17 OMNI with Brilliant Beast and Spooky Ghost to play the 7th Street Entry. $10 gets you in the door. 04/04/17 Local favorites The 4onthefloor will be playing the Triple Rock Social Club with Tabah . Do you realized it’s 4 (April) on the 4th? 04/04/17 The Molochs (not the ancient child eater god or the metal band called Moloch) will be playing the 7th Street Entry on this night. The Los Angeles-ish musician (by the way of Buenos Aires) will be promoting his new album America's Velvet Glory. Cosmonauts is the co-headliner. Cult of Lip to open. Additional details at first-avenue.com, $10 entry fee. 04/04/17 Scottish trio Biffy Clyro sold out the Turf Club on Tuesday. We reviewed their record Ellipsis, last August and wrote, “A recurring theme found in the album’s lyrics is the concept of “fighting back” against one’s personal demons. An ideal of living life unfettered, like an animal, also recurs throughout. Frontman Simon Neil has said that Ellipsis was created to be a volatile “fight rock, pint-in-the-face rock,” album.” O'Brother to open. 04/05/17 Big Wild is playing Fine Line Music Café; touring in support of their debut EP Invincible (Foreign Family Collective). The band is co-signed to Seattle’s ODESZA. Phantoms and Imagined Herbal Flows to open. 04/05/17 Vienna-based Sohn (aka Christopher Taylor) returns to Minneapolis at the Triple Rock Social Club. 04/05/17 String Cheese Incident will grace the Palace Theatre. 04/05/17 Thao & The Get Down Stay Down is returning to Cedar Cultural Center. Yowler to open. Seattle's The Head and the Heart just stopped by First Avenue, in Minneapolis, as part of their national tour in support of Let's Be Still. The album was released last week, October 15th, 2013, on Sup Pop. Opening up for this sold-out folk show were Quiet Life, from Portland. I got the impression that the band are close friends with The Head and the Heart and they were really grateful to be sharing the stage with the headliner. The band had a very brief thirty minute set with about six songs, starting with "Devil's Kin", from their latest album Wild Pack, and ending with "Shaky Hands", which I think I heard was a new song, written about a friend's divorce. Highlight of their set was "Messin' Around", mostly thanks to the organ-playing and catchy (easy to remember) chorus. Since we last saw Thao Nguyen, she was at the Cedar earlier in 2013. This truncated set featured a lot of new songs, taken from her latest release We the Common, including "Holy Roller" and "Every Body". The new material, as I discovered it hearing it live, is more aggressive than her folk songs from her previous two albums. Although the set was shorter, Thao display her talent for all things strings: jumping from guitar to acoustic to banjo to steel guitar. It was fun to watch the transitions. Prior to The Head and the Heart taking the stage, whoever was manning the music was playing nothing but Velvet Underground songs. It was a fitting tribute to Lou Reed, who passed away that day. Then the intro music of "Springtime" was played on the speakers and suddenly The Head and the Heart launched into "Summertime", featuring Charity Thielen on lead vocals. You soon discovered that vocals were shared among the trinity of Charity, Josiah, and Jonathan. And, in fact, the three of them does a lot of tight harmony on many of their songs. As you can see from their setlist, about half the songs are from their latest album Let's Be Still, including "Summertime", "Homecoming Heroes", "Shake", "Cruel", and "Josh McBride". You could always tell which songs were from the debut self-titled album because they usually had the audience singing along, in particular the set closer "Rivers and Roads". Encore were "These Days Are Numbered" (featuring Charity solo), "Gone", and "Down in the Valley". After seeing how both the Head and the Heart shows sold out, singer Jonathan Russell just could not believe that all these fans came together. "You're all strangers in one room," Russell said, "It's crazy." You get the feeling that the band also agree that bringing people together, this is what they are about. The Head and the Heart's latest album, Let's Be Still, is out now on Sub Pop Records. The band has been selling out all their double shows, so if you don't have a ticket now, you may be out of luck. Maybe you could grab a ticket early on the next tour? 12.03.13 | Seattle, WA | Key Arena ! Did I not warn you that " the band to head out on tour in 2013 in support of the new album"? I have just received confirmed tour dates for Thao & The Get Down Stay Down for 2013. As expected, their latest album, We The Common, will be out February 5th on Ribbon Music. The title track "We The Common (For Valerie Bolden)" recently premiered on SPIN.com (which incidentally shut down its print editions and is now strictly digital). The song was said to be inspired by Thao Nguyen's volunteer work with the California Coalition for Women Prisoners. Pre-ordering the album via dominorecordco.com will you get you two bonus songs (Melanie's "Brand New Key" and The Troggs' "With A Girl Like You"). The two songs are available as a limited edition 7" with the vinyl order. I'm heading out to see red-head A Fine Frenzy tonight at Mill City Nights in Minneapolis. I will also swing by 7th Street to see Canadian six-piece, Hey Rosetta!, so if you're coming out, come say hi to me. I'll be in the front. I've been checking out random shows on Stageit. Most of these artists I've never heard of, except when I saw young Jenny Owen Youngs! It's about $1 for 10 Notes, so she's charging $5 per ticket. What's funny is, I noticed it changing from 40 Notes to 50 Notes. I don't know what it is, but have you ever pick up an item in a retail store and noticed a different price over an old price? If the older price is higher, you'll buy it and think it's a deal. If the older price is lower, then you think you're being ripped off! That's okay, I can't really attend because I'm heading out early. Plus, I don't want to take any seat from her fans; I believe her show will virtually "sell out." Besides, I'm saving my 'notes' to see other random shows. I kind of wish Stageit had free shows, but I believe there is a minimum of 1 Note (10 cents) per show. Also, if you buy a ticket to a show and forget to show up on that date, you don't get a refund. So be warned about internet failures or not being home or plain forgetfulness. I also wish they'd offer a download of the show in case you want to re-watch or if you get disconnected, but Stageit is live only. Maybe charge a premium for the video download or offer it free with your ticket? I've already seen Youngs in person at a show a few years ago, and was quite impressed with her. Her third studio album, An Unwavering Band of Light is out now. We've been covering Thao & the Get Down Stay Down for the last five years, so we love her. Their latest song, "Holy Roller," just premiered on their website and youtube. The song is from forthcoming record We the Common, out February 5th on Ribbon Music. The album features twelve new songs, including a duet with Joanna Newsom. Frontwoman Thao Nguyen had this to say about the song, "It was the first song I wrote for this new record…it marked a shift in how I operate. I was steadily, in an overdue way, becoming grateful for everything and everyone I had. I tried to capture a sense of revival and a determination to be better." Expect the band to head out on tour in 2013 in support of the new album. The Time called Tift Merritt's voice as "achingly beautiful country-tinged tunes hark back to the musical work of Joni Mitchell, Mary Chapin Carpenter and Leonard Cohen." I think they nailed it. I just got word that she's heading out on tour in support of her Yep Roc Record's debut Traveling Alone, which is out now. I don't think she'll be 'traveling alone', maybe you'll see her with her husband and longtime collaborator Zeke Hutchins? New York City's Beca is releasing Born to Fly EP on November 20th, her second release on UK's This is Music Ltd. You can hear the track via Under the Radar. Don't really know much about Beca, but her biography insists "a female Serge Gainsbourg produced by the RZA." Don't they mean Charlotte Gainsbourg, or is his daughter too sweet? Charlotte was in a dark, dark movie called "Anti-Christ," which is far from sweet or innocent. To me, I've always thought Serge was really talented singer and songwriter, but a bit of a chain smoker and womanizer. Maybe Beca's a manizer? I don't know if there's actually a word for what I'm looking for. Landing in London recently with a brand new project under the Beca pseudonym, “Let’s Run Wild” is the New Yorker's debut EP on This Is Music, revealing a fresh, darker, moodier sound that fits Beca like a glove. Imagine a female Serge Gainsbourg produced by the RZA. There will be a Born to Fly EP release party on November 13th in Pianos in New York. Something in Spanish and Lady DM (DJ set) are also on the bill. My favorite sailor song is "Jackie" by Sinead O'Connor. It's about a ghost who mourns for her husband, lost at sea and never found. It's very heartbreaking and I really love the use of violins to sound like a threatening thunderstorm in the song. Below are some bands that's come across my email about the sea. Seattle-based violist, Alex Guy, goes by the stage name Led to Sea. The exciting news is that she's touring with Thao & Mirah (and you know we love Thao here). I've dug around to find out more about Led to Sea and I think she has two albums now, the most recent is called Into The Darkening Sky. From the reviews I've read, everyone seems to agree on one thing: she's amazing live... which incidentally brings us to her live dates - starting today, April 22nd at the Northwest Folklife Festival. I'll probably pick up her album at the Cedar show, she's coming here to Minneapolis on June 2nd. I don't know much about Seapony, other than that I will probably like them since they are on Hardly Art records (the last two albums I reviewed from them are amazing). Anyroad, it looks like Seapony is a trio: songwriter Danny Rowland, singer Jen Weidl, and bassist Ian Brewer (note: no human drummer). Their music is described as "fuzz-drenched guitar playing simple chord progressions, topped with concise melodic hooks and breathy vocals." Sounds excellent. Julie Baenziger is better known as Sea of Bees. I've previously reviewed her cutely named EP, Bee Eee Pee, and I thought her vocals sounded like "small cute child". The press is buzzing: But as always, the real star is Bee's lovely and distinctive voice. Well, it looks like she's going on tour with Stornoway, a band that will likely bring a dolly on stage. Her new album is called Songs for the Ravens and since it doesn't look like she'll be come through Minneapolis, I might look into trying to get her album for review (when I have more time). Barefoot Dance of the Sea seems to be an all-girls band (a trio of Rebecca Wood, Beth Gibson & Sophie Cochrane). Apparently two of them are from the Hot Puppies (which I'll admit, I've never heard of either). Their upcoming release is called 'Til Voices Wake Us, a six-track limited edition EP (only 150 copies of the CD will be released), coming out May 16th. The details I have is that it will come with a silver and translucent foiled packaging. Sounds delightful. Described as "two-and three-part harmonies and enchanting minimalist instrumentation", I would imagine it to be a lot of folk-harmonizing-action. I do like that melody-thing, so I might check them out later down the road when I have more time. The sound that The Sea Kings make is rooted in folk music, with branches twisting through crunchy jazz rhythms and contemporary pop melodies, all under an acoustic canopy. Their lyrics convey images of towering cliffs and sandy beaches, reflecting a shared longing for home derived from a life of self-imposed exile. The Sea Kings is from England, but the email I got also mentioned that they are specifically not from Scotland. Perhaps there's another band called Sea Kings ? This one consists of James Wills (Guitar), Joe Holtaway (Mandolin) and Jake Alexander (Percussion/Cello), all singers apparently. I was also given a Spotify link, which is like a Unicorn in the States: it doesn't exist here. I know Ryan and I talked about it for hours two years ago, but Spotify still can't sort it out here. Their EP is called An Introduction To The Sea Kings and available on most digital retailers. Details of their continuing tour dates are listed below. Setlist ♥ Cedar Cultural Center (10/27/09). The Cedar Cultural Center is like the NPR of the venues around Minneapolis. The venue is usually a sit-down (removable fold-out chairs) venue that seems to be catered to World Music, jazz, and acoustic/folky bands. That's exactly the atmosphere last night, when Thao with the Get Down Stay Down, stopped by on their on-going tour. The Cedar is notorious for keeping its schedule, so starting at 7:30pm sharp, was David Shultz and the Skyline (myspace) a pretty mild singer/songwriter that did end with a strong finish when Get Down Stay Down's Adam Thompson and Willis Thompson joined him on stage. The Portland Cello Project, aka PCP, (official / myspace) is an interesting band. They consist of five cellists, who, as told by ringleader Douglas Jenkins, started around the Portland area between classically trained musicians. Lots of highlights, the Pantera cover, "Mouth For War", the Halo theme song, and the Elliott Smith cover. You can tell they like Smith, having stated that he passed away six years and two weeks. Thao with the Get Down Stay Down was eager to get on stage. Lots of foot-tapping and lots of hand-clapping. Thao admitted that this was only the second-ever sit-down venue they played. That the other one, it was a Christian college, and they weren't allowed to dance. "It was the Footloose town!," she laughed. Since that story, the audience seemed to warmed up and pretty soon everyone stood up. This is weird, considering that I don't think I've ever seen the venue with people standing up. Thao with the Get Down Stay Down ♥ Cedar Cultural Center, Minneapolis (10/27/09). Highlight of the show for me was them doing earlier songs, like "Feet Asleep" with David Shultz and Douglas Jenkins joining on stage to help out. In fact, throughout the show, various other band members joined on stage to play. As you can see on the setlist list, they ended with "Easy" and their encore was "The Give" and "Fear and Convenience". What's not on their setlist is "Violet" and a goofy Salt N Pepa's "Push It" cover. Thao Nguyen with the Get Down Stay Down are currently on tour. Their latest album, Know Better Learn Faster is out now. For a free download song, "Know Better Learn Faster", head over to their record label, Kill Rock Stars. My favorite songs are about rejection, despair, and soul-crushing loneliness. I also like songs that make you dance like an inebriated uncle. For me, these two qualities are not mutually exclusive. On Thao Nguyen’s latest album, Know Better Learn Faster, she provides me with plenty of material with which to dance/cry, a combination that I’m sure is freaking out my roommate. Know Better Learn Faster starts off with a room full of clapping and hollering. “If this is how you want it, okay, okay,” sings Nguyen, along with a chorus of mournful voices. It’s a haunting dirge that quickly turns into a stomping hoedown, and it acts as an oddly appropriate segue into the next song, “Cool Yourself.” The chorus of voices returns for the oh-whoa-whoa refrain, and they make several appearances through out the album, providing a crowded, communal tone. It may not be a total Andrew W.K. vibe, but there’s definitely a party happening on this record. But even at its most infectious, the album’s lyrics always hint at something slightly darker. 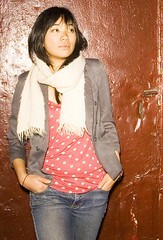 On the rambunctious “When We Swam,” Nguyen mourns the loss of a drowned relationship, all the while luring in listeners with the instantly danceable chorus: “bring your hips, bring your hips to me.” As seen on previous album, We Brave Bee Stings and All, Nguyen showcases a recklessly bold and honest style of songwriting. “What am I, just a body in your bed?” she demands on the deceptively buoyant, “Body.” Even under a smokescreen of handclaps and cheerful sing-a-long refrains, there’s no denying the flare of aggression in her voice. It would be easy to become overwhelmed by the album’s chaotic energy, but there are several respites from the party scattered throughout the album. “The Give” is definitely more subdued and reflective than the first four tracks, but it is by no means quiet. Taking on the persona of a family patriarch, Nguyen spins a bittersweet narrative about broken promises and tokens of regret. It seems like an unlikely interlude within such an upbeat album, but the melancholy tone weaves in and out of even the punchier songs. It’s never blatantly obvious, but it lurks in many of the songs, adding a touch of pathos to even the most rowdy choruses. True, these songs won’t make you weep, but it’s definitely not mindlessly catchy fluff either. So whether you’re looking for something to dance around in your underwear to or something to mull over on the train ride home, you can probably find a good balance of both on this album. Either way, you won’t end up slitting your wrists or waking up to find unsavory pictures of yourself on Facebook. See? Everybody wins. There's a lot of buzz around this singer, Thao Nguyen and the Get Down Stay Down (seriously, just look around). One of our reader asked us to look into this, purely because they had recognize her last name. The reason why 'Nguyễn' is such a popular name, according to this Vietnamese guide book that I got as a gift, it said that one of the kings of the Nguyen Dynasty gave permission for anyone in Vietnam to take his last name. So virtually overnight, everyone became a 'Nguyễn'. At least that's one of the theories. I thought I read somewhere else that anyone that served under the Nguyen rule had their names changed to Nguyễn, even as lowly servants. Anyway. So Thao Nguyen has a new album that's coming out on January 29th called We Brave Bee Stings and All. The title of the album comes from one of her songs, "Swimming Pools" (which you can hear on her myspace). She's also going on tour in London starting on January 17th with Willis, see tour information below. There's a few songs that I really liked off the new album, one of them is "Big Kid Table". The song seems to be about her shyness: "And you follow me/Into the forest/Positioned and ready/Ready for a kiss/But I never gave you nothing/Not even to hold/Or wear around your neck/Or rest against your collarbone". I also really enjoyed "Feet Asleep" on her album, which originally appeared on The Sound the Hare Heard, a Kill Rock Stars compilation. The song is for her mother, who's "worked too hard for too long and has never felt compelled to complain or lament". So look for Thao Nguyen on tour as well as the new album, We Brave Bee Stings and All, out Jan 29th on Kill Rock Stars Records.